When brewing and serving beer, being able to provide a smooth texture is just as important as an excellent flavor profile. Over the years, there have been new developments in how beer is brewed, giving brewers the ability to create a much more immersive experience for their customers. Most recently, nitro brewing has become a popular alternative to traditional brewing methods and is quickly transforming the way beer is enjoyed. Here is a basic explainer of what nitro brewing is and how it can be accomplished. Traditionally, after a batch of beer is brewed, carbon dioxide is infused into the batch to give it a carbonated effect. The amount of carbonation used varies depending on the type of brew and the flavor profile. As the name suggests, nitro brewing primarily uses nitrogen gas to complete the texture of the beer and gives it a much smoother feel compared to using carbon dioxide alone. A defining quality of a nitro infused beer is its visual aesthetic. Unlike carbonated beers, the micro bubbles formed in nitro beers fall downwards. 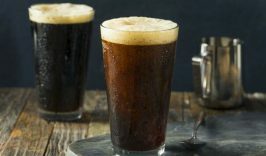 One of the benefits that nitro beer brewing has over traditional methods of brewing is that it provides a more substantial and longer lasting head after the beer is poured. Since nitrogen doesn’t react like carbon dioxide once it dissolves, nitro brewing helps the beer maintain a fuller profile for a longer duration. While carbon dioxide is still used in nitro beer brewing, the ratio of the gas used is much lower when compared to traditional brewing methods. Typically, during the nitro beer brewing process, there is a 70-30 split of nitrogen and carbon dioxide used. To serve nitrogenated beer, bars and breweries use unique faucets and mixed gas systems to infuse the beer. The faucet used is specially designed with small holes at the tip. Beer is then forced through these holes at a strong psi which then causes nitrogen bubbles to form in the beer. This process is the opposite of ones used for traditional carbonated beer as too much pressure would cause the beer to become overly foamy. To consistently serve nitrogen infused beer, bars and breweries need to have a steady supply of nitrogen gas to use with their infusion systems. While many companies opt into having nitrogen gas containers delivered to their businesses, this can prove to be a costly approach over time. A cost-effective alternative to these deliveries is by making your own nitrogen gas on site. Nitrogen generators are a great way to create a steady supply of nitrogen gas for your nitro brewing needs. These specially designed container systems come in a variety of sizes, have minimal service requirements, and high energy efficiency. NiGen International makes containerized nitrogen generators available to a variety of bars and breweries, that can be regularly serviced by their certified technicians. Nitro beer brewing has become a popular alternative to traditional brewing. Not only does nitrogenated beer provide a smooth, favorable texture for the customer, but its infusion of nitrogen gas offers a significant visual effect not seen in other beers. If you would like more information about how onsite nitrogen systems improve the nitro brewing process, contact NiGen today.